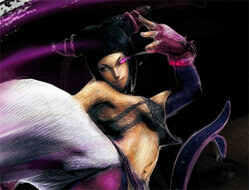 MonsieurLâm sent over this Super Street Fighter 4 clip showing Juri and T. Hawk in action. TTWK also found another video showing a new trailer for the game, which features Dee Jay, T. Hawk and Juri along with several members of the old cast. Gamespot caught up with Super Street Fighter 4's producer, Yoshinori Ono, and gathered a bunch of great information from him about the new title. Here's a summary of what Ono had to say. 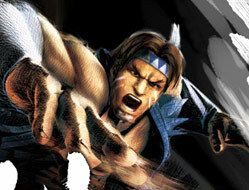 Super Street Fighter 4 is tentatively set for a spring 2010 release. The update will be released on a disc, and won't be available as DLC (Downloadable Content) — but the game will be priced as an upgrade — not a brand new title. As this time, they're thinking of adding about 8 characters to the game. (Rumors currently have this pegged at 10 fighters total). Capcom is planning on adding more features to the online modes. Things so people can enjoy playing as a group. (Sounds like lobbies are in). There will be tweaks and balance changes, along with more online stuff and new features the developers are adding in. Bonus Stages aren't 100% confirmed, but it sounds very likely they'll be making it into Super Street Fighter 4. You won't need the original disc to play this update, but fans who have a copy of SF4 will be, "happy to have held on to it," as they'll be receiving something nifty. Juri is a Korean Tae Kwan Do fighter and is very important to the storyline. They skipped "Champion Edition" and "Turbo" and jumped straight to "Super" for the name of this upgrade because of the scale and size of what they're planning. The surprise that was teased last night is the launch of a new Japanese Super Street Fighter 4 website. While there's nothing earth shaking there, a character trailer for Dee Jay is said to be expected this Thursday, and it sounds like the development team will also be blogging every Tuesday as well for an indefinite period. Also, you can find character profiles for T. Hawk and Juri, coupled with some screens shots you may have seen before, along with a new blog entry by Shiozawa-san. Here's a somewhat rough translation of T. Hawk's and Juri's profiles. Hero of the "Thunder Foot" tribe. With his father Arroyo Hawk's life, and his tribe's sacred land taken from him by M. Bison (Dictator), T. Hawk continues to fight to reclaim what is rightfully his. He is a gentle man, always respectful towards animals. He is chasing Shadaloo in order to find his beloved Julia. A spy working for S.I.N., codenamed "Spider". She is belligerent and provocative, and likes to taunt and make fun of her opponents. With no regard to honor, money, or society's rules, she only cares about events and affairs she herself find interesting (basically, she's dangerous and anti-social). Her left eye has been replaced with an artificial one, equipped with a, "Feng Shui Engine," which boosts her powers. Thanks to Jigsaw, Azrael and Punisherr for translating part of the bios. 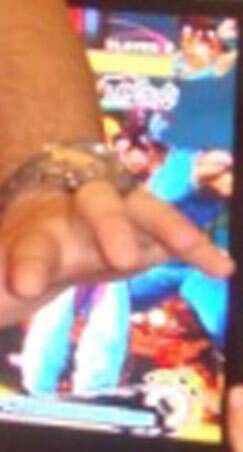 A reader sent in a heads up that Capcom of Japan has posted a new teaser trailer for Super Street Fighter 4. While there isn't much there, the new clip is just a variation of the original Street Fighter 4 trailer — there's a date showing 2009.09.29 at the bottom and 17:00 JST (Japan Standard Time). A quick conversion shows this would end up being on Tuesday at 3 a.m. Pacific Standard Time for us over here in America, so it looks like we'll be getting some news very, very soon. Since this is a, "blink and you could miss it," kind of thing, I took some screen shots so it's a little easier to see some of the action. The game was apparently shown to members of the press behind closed doors at the Tokyo Game Show, but Capcom isn't making it official just yet. But, you can take this post as confirmation as Capcom is saying that Super Street Fighter 4 exists and an announcement is coming very soon. Update: A reader also pointed out this image from Gamepro Germany. 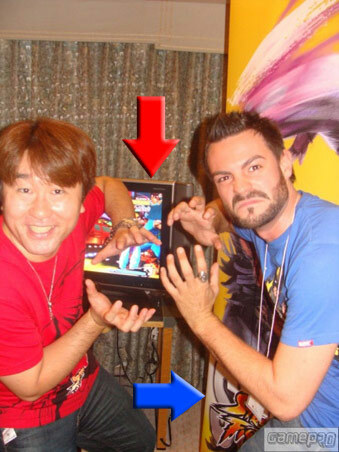 At first glance, it's just a shot of Yoshinori Ono with some other guy, but if you look a little closer in the background, you can see T. Hawk in his Street Fighter 4 form. Also, in the photo on the left, near the guy's leg (blue arrow pointing the way) you'll see an "S" which Genini pointed out would likely be the first letter in the word "Super," and that this is part of the new logo for Super Street Fighter 4. If you want to go a bit further, click here to see rumors of what we heard might be in the game. Capcom Community Manager, Seth Killian, ran through Frank West's move set in Tatsunoko vs. Capcom. Check out the video via Gamespot. Capcom's Rey Jimenez, Marvel vs. Capcom 2's producer, chimed in on the Unity Boards responding to a fan who wants to see a re-release of MvC2 on the PlayStation 2. Also, digging deeper, Christian Svensson jumped in to talk about the profitability of titles developed out of Capcom's western offices. As a Capcom gamer I'd like to see a MvC2 re-release on the PlayStation 2. Not everyone has access to a PS3 or XBox 360 and a high speed connection. Cost to have a license from Marvel to re-release a PS2 version. This would need a new agreement. Marketing costs to promote the re-release. It's not really worth it if no one knows about it. There is a minimum amount that manufacturing will make. We cannot just run a few hundred or so. The demand for the product. I know there's a lot of other things I'm missing also. If the math for all of those factors doesn't really add up, it's really hard to justify the re-printing. Fortunately, I just checked eBay and it seems PS2/XBox copies have gone down significantly in price. I'm sure with enough tenacity, you might be able to get one for a reasonable price. Sven: To answer the question succinctly, nope. Western development out of our office is profitable. Thanks for the concern though. SpeedBrkr posted some nifty Street Fighter IV artwork inspired by the sprites in the 8-bit Mega Man games. Take a look. If you'd like to get a Femme Fatale Mad Catz SF4 Tournament Edition FightStick, now you can grab them from the Capcom store. These are supposed to be quite limited, so if you really want one, you should act quickly. The store added a bunch of other random goodies of interest, including the DarkStalkers and Street Fighter tribute artbooks, along with lots of other stuff. If you haven't hit the store in awhile, it's worth taking a look around again. The Japanese Street Fighter 4 blog was just updated again. Many people had expected this blog entry to signal the official announcement for the upgrade/sequel to Street Fighter 4, but like a broken record Shiozawa is playing the same old song. Readers again were told to wait, "just a bit longer," for an announcement on Super Street Fighter 4. But with the Tokyo Game Show currently taking place and running through Sunday, many expect they'll only have to wait a few more days for it to be official. Whenever the news breaks, you'll be able to find it here. The rumors for the Street Fighter 4 upgrade have been picking up steam with the Tokyo Game Show currently taking place. The game is now being called 'Super Street Fighter 4' in most circles. Here's a bulleted rundown of the stuff that's being rumored. Get your salt shaker out and keep a steady supply coming — because the list you read below is confirmed in no way, shape or form. Capcom sent out a press release document today that stated the United States release date for Tatsunoko vs. Capcom: Ultimate All-Stars on the Wii is January 26, 2010. Japan is set for January 28th launch day and Europe follows on January 29, with both overseas releases also happening in early 2010. Frank West from Dead Rising has been confirmed for Tatsunoko vs. Capcom at this year's Tokyo Game Show. Here's his artwork and some gameplay images. This confirms one of the five leaked characters we heard about earlier, with likely announcements coming in the future for Zero from Mega Man, Condor Joe from Gatchaman and Yatterman No. 2 from the Yatterman series. To see more, click the link below. Spotted over on Capcom-Unity that JGonzo pointed out a very sweet video of an artist drawing Zangief, but everything is sped up with background music, making for an entertaining video. Just ignore the first few seconds though. Ha-dou-ken pointed out a tech-heavy promotional-based piece, talking about what the Dimps' development team went through while creating the character models for Street Fighter 4. Buried in the story is this quote, " [...] the team members were able to model characters in an intuitive way that was reminiscent of shaping clay, creating modeling data for over 25 characters, each with two sets of clothes." It's interesting to see here that there were over 25 character models built, with the two sets of clothes alluding to the fighters' alternative costumes. It'd be nice to get the actual number of models built, but it could just be they're talking about Dee Jay and T. Hawk, which we know from earlier remarks had already undergone the 2D to 3D conversion for the game. Anyway, while this article may go over the head of anyone not versed in graphic technology, it's a solid read if you want to know about some of the behind the scenes work that happened while creating the title, sans the promotional aspect. Here's a clip. The project began when designers at Dimps’ development workshop were handed a series of scanned sketches and drawings from Capcom’s Art Director, Daigo Ikeno. Their mission was to take the scans and create “the best quality images that can move in 3D”. More specifically, they needed to reproduce the nostalgic movements and atmosphere of the 2D animation era while at the same time create next-generation graphics that had never been seen before. In the end, they managed to create graphics that went beyond the expectations of even the most devoted Street Fighter fan. Gootecks sent word that the Top 8 matches from the Street Fighter IV portion of the West Coast Warzone tournament have been posted. Unfortunately, the clips can't be embedded, so you'll have to hop the link to check them all out. Everything is very nicely edited though, the video is clear and the player names are displayed up top so you always know who's fighting. It's especially worth watching this match between YeB (Gen) and fLoE (Sagat), seeing Gen being played very well against Sagat makes for an entertaining fight, especially when YeB continually busts out 18-hit combos. Starting today, Street Fighter II Hyper Fighting is only 400 MS points ($5.00 USD) through the XBox Live arcade download service. If you want to experience some old school action, this is an inexpensive way to go about it. Microsoft also discounted a bunch of other titles, including some non-Capcom fighting games, like ULTIMATE Mortal Kombat 3.